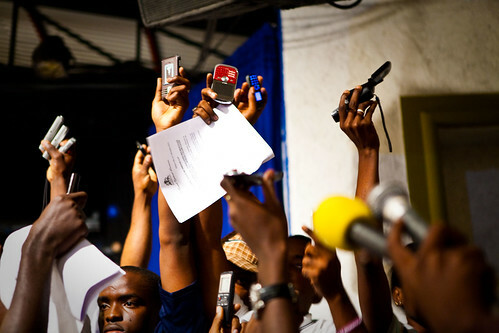 The top two candidates, Manigat and Celestin, will now go on to a run-off that will take place on January 16th. The reason why there are countless gunshots outside our complex, burning barricades in the streets, and loud explosions filling the night is because Michel Martelly will now be left out of the second round. 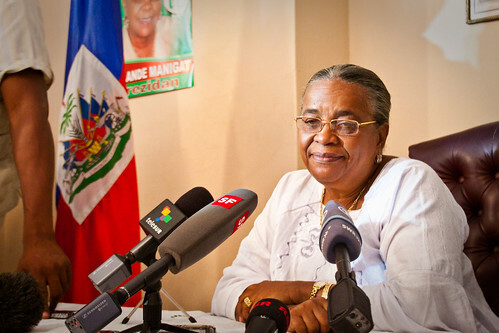 A heavy favorite amongst the people in Port-au-Prince, Martelly’s followers are now flooding the streets and protesting results that they claim are fraudulent. 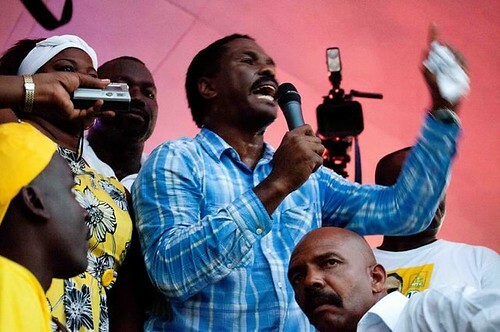 Jude Celestin, who is backed by current President Rene Preval, has been accused of election fraud throughout the country, which makes this announcement that much harder to swallow for the Haitian people. At one road-block that Ben came up to, they asked him for gasoline so they could light a truck on fire that the protesters had pulled into the street. He said ‘no’, and they then threw rocks at him. We passed the same road-block 10 minutes later, and they had, in fact, lit the truck on fire. He explained that the people are unhappy with the results, and that they should be…as they were incorrect. 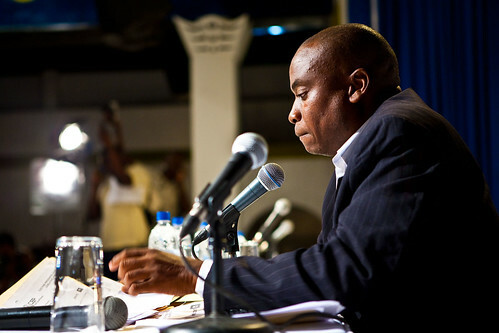 “President Preval put pressure on us,” he explained, “we were forced to include Celestin in the second round.” I was shocked, this man was clearly scared for his life, yet he was divulging this huge bomb of information that the President of Haiti forced one candidate out of the run-off, and inserted his own hand-picked candidate into his place. 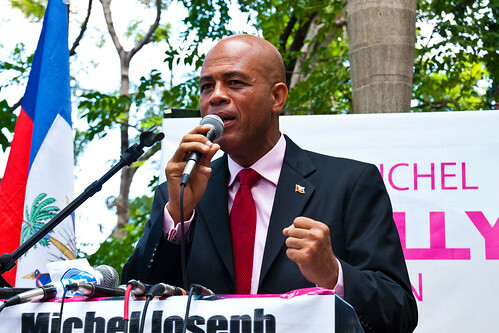 “We kicked Martelly out of the race, and now the people are going to destroy the city,” he said. I prodded further, asking him what the correct percentages were. 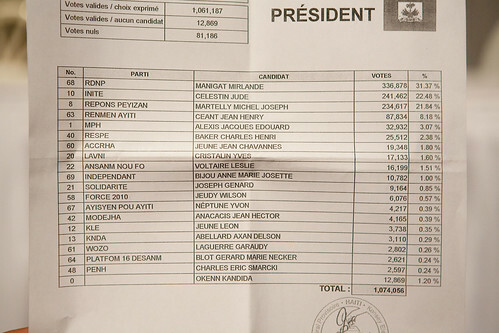 “Manigat had 39%, Martelly had 27%,” he said, “and Celestin had 15%.” If these are, in fact, the correct results, then Michel Martelly has been cast aside from the second round of an election that he fairly won a chance to participate in. The man had been abandoned by his colleagues at the CEP who had “escaped to the hills”, and he pleaded with us to give him a ride to his home in lower Delmas, which is not a good part of town (especially considering what was happening). Things were quickly escalating, and the people around us were starting to give the man dirty looks and yelling angerly at him. We told him to jump on the back of the motorcycle, “We need to get out of here, NOW,” Ben exclaimed as he started the bike. We took the man down the street to an empty street corner and let him off, going any further would have been dangerous as ahead of us in the road was a newly started fire. As we pulled away the man stood in the middle of the road, searching for somewhere to go, or someone to bring him to safety. He had been abandoned by his co-workers, and now had to defend himself amongst his own people, all because of a decision the CEP was forced to make. We went straight home, passing a barricade that a group of men were putting up at the entrance to our neighborhood. Ben, graciously, allowed me to drive his motorcycle home, as the streets were no longer safe to walk on. “If you’re going to go, go now,” he hastily said, “and don’t stop.” Ben is a really level-headed guy, so when he says that it’s not safe you know it’s not safe. I accelerated down the road towards my complex as a group of men were congregating in an alley ahead of me, and made it safety home as the sound of gunshots filled the air. The following days are expected to be filled with more protests and, I’m assuming, an appeal by Martelly. According to the man from the CEP, these results are final, and they will now just move on to the run-off, but I was also told that the final results would not be released until just before Christmas, and that these were just preliminary. Either way the people here feel slighted, and are upset that yet another election has resulted in the same fraud that has permeated their government for decades. Stay safe. Thanks for your reporting. Thank you for your reporting, it’s much appreciated. You, Lexi and Ben are a better source of news about Haiti then CNN, ABC or any American news network! Thank you! A lot calmer over here in Leogane, but still pretty chaotic. That’s a pretty amazing statement from the CEP. Everything feels pretty unpredictable right now. Thank you for making the situation clear to me…you are much better reporters than any of the networks! This blog is FANTASTIC. And the photos (in the previous entries) are gorgeous. Please keep up the reporting! Unrelated directly to the blog posts, but what camera are you using? I’m also keeping a blog of my time here in Haiti and am looking for advice on camera settings. I use a Canon 5D with a variety of lenses. If you want more details let me know! tnx for this update. i’m a student reading all the way from the dominican republic and it’s been very usefull and interesting reading ur posts. tnx for the great energy and effort your putting into this. All posts and pictures are property of Frank and Jillian Thorp. Use with permission only...and please don't steal my work. Disclaimer: This is our personal blog which includes our individual opinions about our individual experiences.